Monaghan Catahoulas owes ‘our start’ in the Catahoula world to Callie. Callie was purchased as our first Catahoula in the spring of 2000 for a companion and farm dog. In 2001, totally by chance, we attended our first NALC show in Tupelo, MS, which is where I was raised. Callie placed in Conformation and in the One-Dog B-Bay. She had never laid eyes on a hog prior to that day. Well, needless to say, after that first show there was no going back - - the fire had been sparked. We shopped around for another Catahoula for quite some time, but just could not seem to find the ‘right’ puppy. Then finally in the spring 2003 we added Casey’s Tuff Enough and later that winter Sandhill’s Miss Mona to our kennel. We campaigned Callie, Tuff, and Mona heavily in working and show events while learning everything we could about bloodlines, breeding, and genetics from the 'old-timers'. With eight championship titles under our belt and seven years of Catahoula experience we bred Tuff and Mona in 2007, thus adding Monaghan's Lotto and Monaghan's Parlay to our pack. Two years later we line-bred Mona to her uncle Sandhill's Jazz-N-Blues and along came Monaghan's Sandhill Ghost and Monaghan's Creole Jazz. And of course we can't forget Moffitt's Spook, he was purchased from Moffitt Catahoulas in 2008. Spook is related to Callie, Tuff, and Mona five generations back; this should compliment or breeding program nicely by bringing us an outcross with a distant line breed. 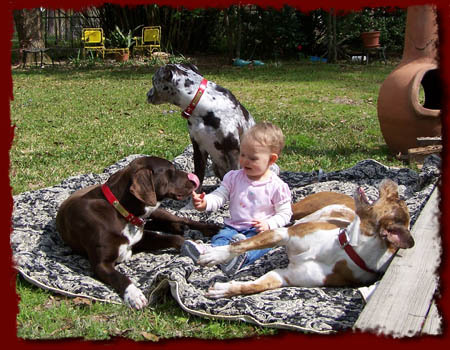 The goal of Monaghan Catahoulas is to preserve, promote, and enhance the attributes of the Louisiana Catahoula Leopard Dog that are the cornerstone of this truly amazing breed of dog. We believe in preserving the Catahoulas the way it was meant to be, a versatile working breed of dog. Starting at an early age, our dogs are exposed to various working environments, livestock, social environments, and obedience training. We believe that for a Catahoula to be a “sure enough” well-rounded working dog, a good handle is a must..
Our breeding and training programs are based on working ability, intelligence, temperament, conformation, and genetics. We carefully consider each of these traits before breeding our dogs. And lastly, but most certainly not least, our dogs are devoted and trustworthy family pets. Detailed information about each of our dog’s personality, accomplishments, and pedigree is available under the “Our Dogs” page. Please feel free to contact us if you have any questions.